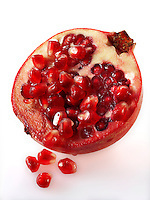 Pomegranate fruit food pictures, photos & images. 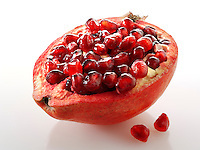 A pomegranate (Punica granatum) is a fruit-bearing deciduous shrub or small tree growing between five and eight meters tall. 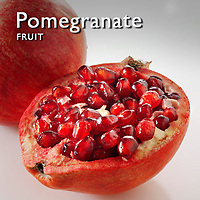 The pomegranate is mostly native to the Iranian Plateau and the Himalayas in Northern India. It has been cultivated in the Caucasus since ancient times, and today, is widely cultivated throughout Iran, Afghanistan, India, Pakistan, Bangladesh, Iraq, Egypt, China, Burma, Saudi Arabia, Israel, the drier parts of southeast Asia, the Mediterranean region of Southern Europe, and tropical Africa. 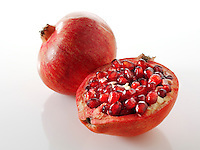 Introduced into Latin America and California by Spanish settlers in 1769, pomegranate is now cultivated in parts of California and Arizona for juice production.